Finding just one right-fit software engineer is hard enough, so what happens when you need to hire engineers at scale? I read this Tweet from Austen Allred, co-founder and CEO of Lambda School, on a Monday. I thought maybe there was an extra zero affixed to that last number. 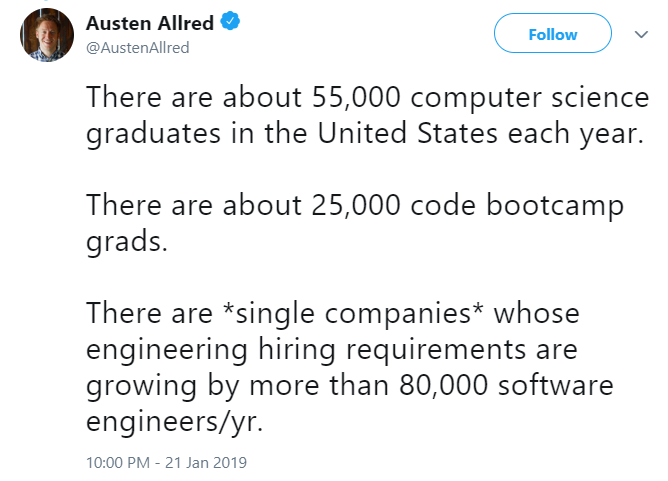 And I’ve read seemingly credible sources that estimate the number of computer science grads from four-year degree programs each year is about 2x what Allred suggests. So, on Tuesday, I registered for the webinar “Hiring At Scale,” a Q&A with Loïc Houssier, VP Engineering at DocuSign, being hosted by Plato. DocuSign might not be hiring 80,000 engineers, but they do have quite a few tech-related openings on their careers page (50+ positions listed under the Engineering & Tech Operations, IT, InfoSecurity & Business Operations, plus User Experience Design & Research categories). The company is based in San Francisco – where the median software engineer salary is $112,405 according to payscale.com – and also has offices in Seattle, Dublin, Paris, and Sao Paulo, among others. DocuSign went public in April 2018 at a valuation of $4.8 billion and raised in excess of $500 million prior to that. Point being, DocuSign is the kind of software company that others worry about losing engineers to, yet it’s also a company trying to hire a skillset that is in very short supply. Here are nine takeaways about hiring engineers at scale from Houssier’s conversation with Doug Flaherty, a member of Plato’s business development team. Houssier estimates about 30 percent of applicants come from online career sites. Candidates will do their homework on sites like Glassdoor. 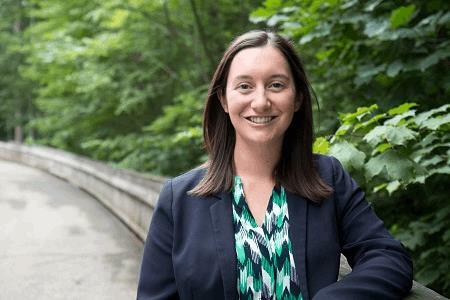 Employees might not appreciate the importance of leaving a review on Glassdoor or voting for a local “best places to work” award, but it’s a business asset that is critical for hiring top engineering talent (or any talent for that matter). About 40 percent of engineering candidates come from referrals. This makes the hiring process faster because the company doesn’t have to “sell” as much since candidates already know the company from the person referring them. DocuSign does incentivize engineers for referrals. Pay it forward even to the candidates you don’t hire. Give them very candid feedback that can help them improve and gain the experience they need. For example, a disgruntled engineer who didn’t get hired sent a less-than-happy email to HR about the process. Houssier picked up the phone and called that candidate to talk through why they chose the other candidate. That 5-minute call was worth making sure the candidate ends the interview process on a positive note. That candidate just might show up again and be a great fit after gaining more experience. At DocuSign, onboarding new engineers is just as important as the process to hire them. During the interview process, you work hard to sell candidates on the team, the projects they’ll work on, and the company vision. Then reality sets in, and that engineer starts going through the day-to-day grind. To combat the initial excitement wearing off, Houssier catches up with new engineers about three months in to make sure expectations are on the same page. It’s hard enough to hire any talented engineer, not to mention a large pool of diverse engineers. But that challenge can be addressed. Houssier says the only way to commit to diversity is to set a standard with candidate pools and stick to that standard. For example, if you know you want to see at least 10 candidates per open position, commit to at least one of those candidates being a female, for example, and don’t make an offer until that’s the case. Although this isn’t feasible for most software companies, acquisitions are a valid option for scaling an engineering team. For example, if you want to get in to the blockchain game, it could be faster to acquire a blockchain startup with 5 engineers than it would be to individually hire 5 engineers with blockchain experience. The “acquihire” model will usually be more expensive, but it’s more efficient and it comes with a ready-made team that already gels. Houssier explains it can be easy to over-scrutinize the entire hiring process, and if you do this, you’ll lose sight of those important soft skills candidates possess. Don’t try too hard to check every single box for a candidate, and don’t have too many boxes to check in the first place, because that can make you forget about the importance of cultural fit. This tip shouldn’t be news to anyone involved in hiring: spend more time assessing cultural fit than technical expertise. Houssier’s parting advice for scaling engineering teams is powerful: don’t let your size be an obstacle or an excuse. An engineer’s ability to make an impact at a small company where the CEO will be aware of his/her work is a huge draw. Smaller companies can also promise more focused work and potentially more career growth. The Google’s of the world will pay more and have better brand recognition, but some engineers would prefer to be a valued individual contributor.